Milk teeth will fall out anyways, so a hole or a missing tooth cannot be that bad right? You could not be more wrong! 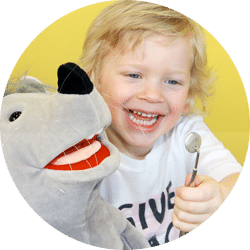 A complete and caries free set of milk teeth dentures does not only ensure a radiant and confident smile of a child but also set the prerequisite for a healthy permanent dentition for the future. 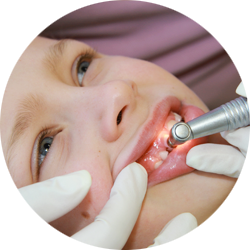 In our "Washzahn" (teeth cleaning) program we meet the perfect provision for a permantent beaming childrens smile. We have developed a three-step prevention program that takes into account the individual circumstances of each child. Fun and distractions are also accounted for. During the professional odontexesis we show funny clips on the ceiling to make our young patients laugh. 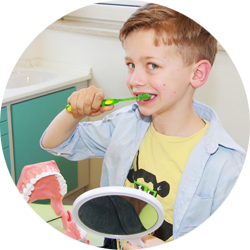 Dental prophlaxis combines all measures to prevent dental diseases - natural healthy teeth for a lifetime. This includes whole and healthy foods as well as professional assistance and support from our "Waschzahn"-Team.